In a Nutshell: Cardholders of the Hilton Honors Card by American Express have many hotel locations where they can redeem their points. Most major destinations boast several Hilton locations, but only a handful of those hotels occupy buildings that are historic landmarks. The Amway Grand Plaza Hotel in Grand Rapids, Michigan, comprises essentially two very different hotels under one roof — the Pantlind Hotel, which retains much of the original 1916 grand opening charm, and the Glass Tower, renovated in 2014 to offer modern decor and conveniences. Guests can choose which side of the hotel appeals to them and still have access to seven distinct award-winning restaurants and bars. Grand Rapids, nicknamed Beer City, USA, by several publications, features multiple breweries and restaurants that specialize in unique culinary experiences and craft beverages. Most people apply for a travel rewards credit card with the hope of future travel — that is, they don’t have a specific destination in mind for the miles they earn but rather a goal of earning enough to go somewhere. That’s especially the case for the Hilton Honors Card by American Express cardholders. CardRates named the card the best hotels reward card for its generous rewards structure, but the true beauty of the card comes from the wealth of redemption options it holds — since it’s hard to find a big city without a Hilton-affiliated hotel. And while Hilton retains its reputation for ridiculously comfortable beds and chic decor, only a few locations under the company’s umbrella have the green light to decorate rooms a little differently and add their own unique spark to the Hilton brand. Among the most popular of those locations is the historic Amway Grand Plaza Hotel in Grand Rapids, Michigan, which is essentially two very different hotels under one roof. 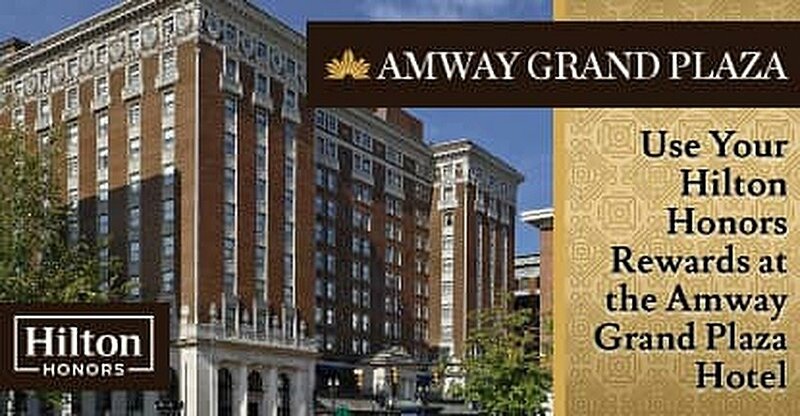 The Amway Grand is a member of Historic Hotels of America®, the official program of the National Trust for Historic Preservation for recognizing and celebrating the finest historic hotels across America. The property originally opened in 1916 as the Pantlind Hotel, providing 387 guest rooms in the heart of downtown Grand Rapids. The Amway Corp. acquired the historic Pantlind in 1979, restoring it to its former glory. The company built the Glass Tower in 1981, which added 27 stories and 295 new guest rooms to the main structure of the Pantlind. Today, the Pantlind still thrives alongside its modern sister site, giving travelers a choice of where to stay within the hotel. The Amway Grand Plaza Hotel is a Curio by Hilton® establishment, meaning it’s part of a collection of individually unique hotels, each with its own history and character. The hotel sits on a prime piece of Grand Rapids real estate, within walking distance of museums and other attractions. The Amway Grand Plaza houses seven different culinary experiences within the hotel — including an award-winning Ruth’s Chris Steak House and Rendezvous, the recently renovated lobby bar, that serves some of the finest wines in Grand Rapids. Hilton Honors Card by American Express cardholders who have accrued travel points can use their balance to discount, or potentially pay in full, a stay at the Amway Grand Plaza and experience everything this historic location has to offer at any time of the year. Seven of the finest restaurants in Grand Rapids are housed within the 50,000 square feet of meeting space in the Amway Grand Plaza. On any given night, guests can choose between comfort food, Latin fare, or several other unique options. Trained experts prepare famed chef Wolfgang Puck’s made-from-scratch comfort fare recipes at both The Kitchen by Wolfgang Puck and the smaller Kitchen Counter by Wolfgang Puck locations. Cygnus27 delivers a Latin-inspired menu and sophisticated cocktail lounge with expansive panoramic views of the Grand River and surrounding cityscape. An exclusive cocktail menu and a variety of light fare eating options is perfect before a night on the town. 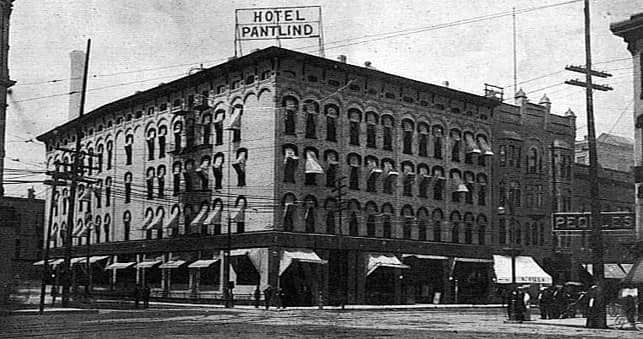 A photo of the Pantlind Hotel in downtown Grand Rapids, Michigan, in 1916. Ruth’s Chris Steak House is world-renowned for its hand-selected steaks and 1,800-degree cooking perfection, but the Amway Grand Plaza’s location provides a distinct difference to the typical Ruth’s Chris experience. Travelers and locals can catch the latest sports action while enjoying burgers, pizzas, and specialty drinks well into the night at GP Sports. Premium drinks are always on the menu at the Lumber Baron Bar, Rendezvous lobby bar, and Starbucks. Guests who are looking to step out and experience the best of what Grand Rapids has to offer often enjoy the many breweries and restaurants available in Beer City, USA. Grand Rapids has something to offer any traveler at any time of year. The popular Rosa Parks Circle, located just outside the hotel’s entrance, is home to swing dancing during the summer evenings and ice skating in the winter. Several museums are within walking distance of the hotel, including the Gerald R. Ford Presidential Museum and the Grand Rapids Art Museum. The plush ballrooms at the Amway Grand Plaza host weddings and other celebrations year round, infusing the hotel grounds with energy almost every weekend. For nature lovers, Lake Michigan is only a short 30-minute drive away. Grand Rapid’s biggest celebration each year is its three-week Art Prize event. Held every September, the competition brings in local and global artists who display their works within the halls of downtown businesses, on building roofs, along the city’s bridges, and even on platforms surrounded by water on the Grand River. The event is free and open to the public. Spectators can vote for their favorite work to win the coveted Art Prize. Travelers looking to redeem their Hilton Honors Card by American Express reward points will find a little bit of everything at the Amway Grand Plaza Hotel in Grand Rapids — from the nostalgic to the modern. And while the culture scene in Grand Rapids continues to grow, the city already offers many of the amenities you’d expect in major cities — without the drawbacks of big-city travel.